Getting leads for your business is hard. Losing leads is super easy – often it’s just a case of not meeting your potential clients when/where they are ready to begin a relationship, being too pushy too fast, and/or not impressing at every step of their buying journey. So, how do we stop losing leads and how do we make it easier for them to convert? Keep it simple stupid – maintain a 1:1 conversion ratio so potential clients have no other choice but to convert or close the browser tab. Okay, so you have a Google AdWords advert or a Facebook advert running, someone clicks through have your killer headline (your promise) but then get redirected to a landing page that has absolutely nothing to do with that headline – they’ll be gone and lost before you know it. It needs to be all matchy matchy. Message match – provide a consistent experience meaning that your advert and your subsequent landing page have the same headline, the same copy, the same images, the same colours, the same offer so they know they’ve ended up in the right place to engage with you. Did you know that (from Google’s data) more than 50% of mobile device users will leave a web page if it does not load within three seconds or less? Sadly, most pages load A LOT slower than that and the leads are lost. Back in February, Google Chrome announced their efforts to make the internet a more secure place. Starting in July 2018, they will begin to label web pages as ‘not secure’ (actually it’s happening already but the penalising will kick off in July). Think about it from your potential client’s point of view; if you arrived at a landing page and noticed it was not secure, would you trust the business, submit your personal information, buy from them? Probably not! To get the most out of your campaign, you must first identify who your target audience is, and then segment your leads to best target them. This ensures you’re only showing targeted offers to the most relevant leads, and not wasting time on misplaced offers. 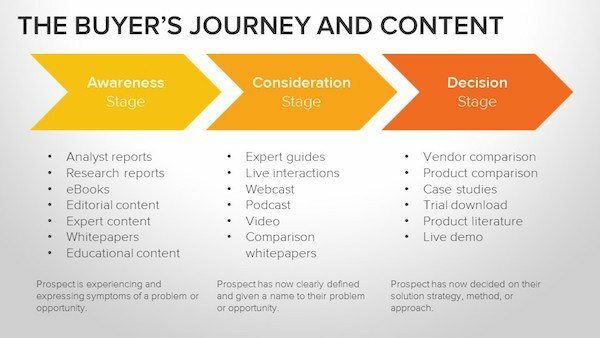 The chart below from Hubspot outlines the three primary stages of the buyer’s journey along with some example content for each stage. Obviously this won’t work for everyone but it’s a great place to start brainstorm your offer for the different stages of your buyers’ journey. Previous: Previous post: How do I find the right copywriter or social media manager?